We carry two styles of Promar Hoop Nets - Delux Hoop Net and Eclipse Hoop Nets. Both work great, main difference being once your catch is inside the Eclipse net, it is more difficult to escape. 1. Lights - In most cases, you are going to be using these at night: USE some sort of light on your floats. Either the chemical or LED (we carry both). More times than not, there is a good current and your nets are going to move. There is nothing worse than spending a bunch of time trying to track your nets down the entire night. Also, a great bonus is the reflective tape - put that on your floats as well. 2. Bait - Most common is Mackerel and Bonita works well too. We have heard things like chicken, cat food, etc... Those might work, but you gotta ask, when are crabs/lobsters eating chicken? The Promar Bait Cages work great and make it more difficult for your bait to escape the net. 3. Checking Nets - We recommend soaking your nets ever 20-30 minutes, less time if using the Delux Hoop Net. 4. Gloves - Remember you are going to be pulling a lot of rope throughout the trip. 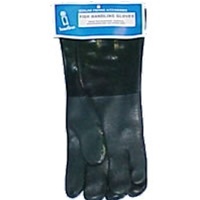 Gloves are a must to protect your hands! 5. Permits - Be sure to have your license and your additional permit (if needed in your state). Fines are very expensive and someone will be watching!